A few days ago there was a problem of being diverted to another site (some music site I think) whenever we were trying to access the Antergos site. At exactly at that time, I did my system reinstall. “The site is under maintenance” . Right now my system is working fine. But I have become apprehensive that I might have done the installation while the Antergos site might have been hacked. Should I once again do the reinstall. I have all my backups on an external Hard disk. I solved the problem by reinstalling antergos. Had all my backups in my external Hard disk. Should have shown more patience, I know. However thanks for looking up my post. Thanks once again. I run an assembled PC with Antergos-gnome. Under gnome tweaks- Extensions- Application menus- gettting “error loading extensions”. Other than this notification I am not experiencing any bugs. Under extension tab, Dash to Dock, Onboard indicator, Start menu buttons and user themes are on. 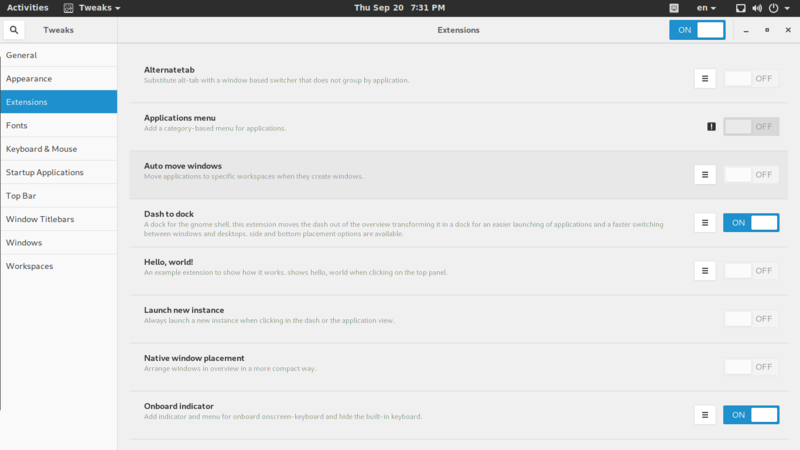 I am attaching a photo of the gnome tweaks page. Thanks in advance.